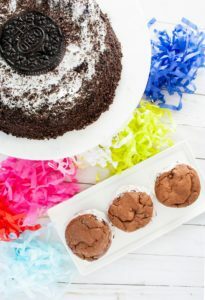 This recipe uses OREO Premium Ice Cream Cake. 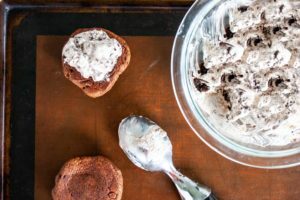 So really this recipe is cookies inside cookies inside ice cream cake! 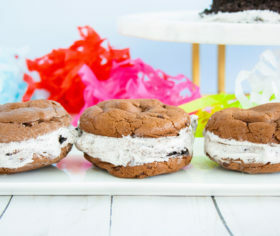 Here’s how to make ice cream sandwiches with ice cream cake! 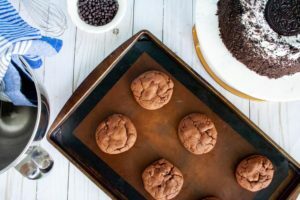 In a large bowl, combine your dry ingredients (flour, cocoa powder, espresso powder, baking soda, and salt). Mix until combined and set to the side. In a stand mixer on low, mix the melted butter and white sugar together until pale and creamy. Butter should be slightly warmer than room temperature before using. Add the large egg and vanilla extract mixing until incorporated. Slowly add in your mixed ingredients. Mix until you get a crumbly dough texture. Add in your chocolate chips and mix for 10 more seconds. Using a spoon, scoop out 12 cookies. Roll them into balls and space them 2 inches apart on a greased or lined baking sheet. Add to the oven and bake for 10-12 minutes. Remove from oven and let cool on the baking sheet for 15 minutes. When ready to assemble, remove the OREO Premium Ice Cream Cake from the freezer. 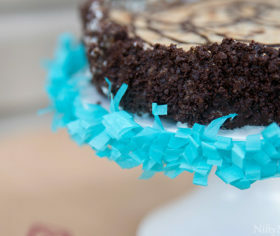 Slice into 6 pieces and add to a mixing bowl. Use an ice cream scoop to mix and combine into more ice cream form. 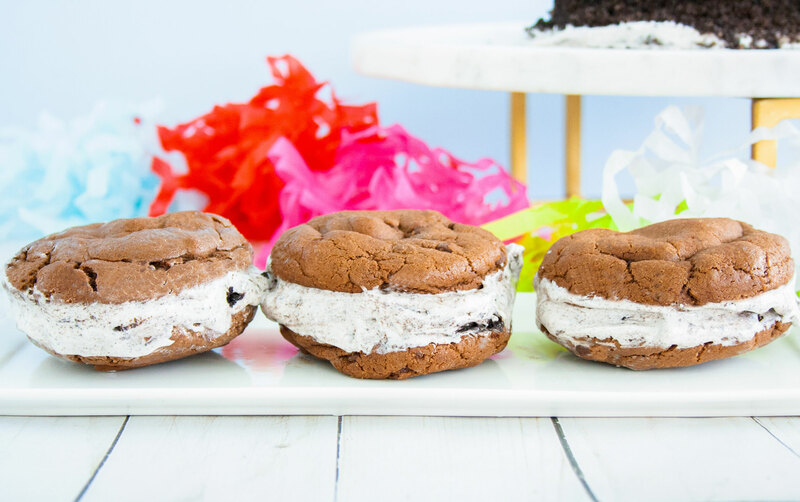 Scoop one scoop of the OREO Premium Ice Cream Cake from I Love Ice Cream Cakes mixture from the bowl and place it on the flat side of a mocha cookie. Taking a second mocha cookie, place it on top of the ice cream to form a sandwich. Repeat until you have 6 ice cream sandwiches. 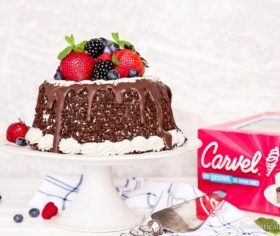 Serve immediately or put back into the freezer for later!